Based on the paint condition and stage of polishing, the right polish can be selected. Use with S17+, S30+, S40 or A15. 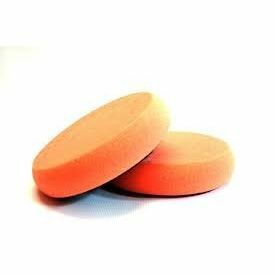 Scholl Concepts Orange Foam Polishing Pad is a medium-hard, dense multi-purpose pad, suitable for most applications including scratch removal, refreshing weathered paints, high gloss hologram-free finishing and wax application. Designed for functionality with intelligent detail - the recessed velour backing enables safe and comfortable polishing in hard-to-access areas while simultaneously preventing damage by the otherwise razor-sharp Velcro face of the back-up disc. Suitable for use with dual action (DA) and rotary polishing machines. Also available in 160mm Spider version with 3D calibrated surface. Pad cut: Fine (2/6) Pad size: 145mm (Medium) What Polishes to use with the Orange Pad: Based on the paint condition and stage of polishing, the right polish can be selected. Use with S17+, S30+, S40 or A15.